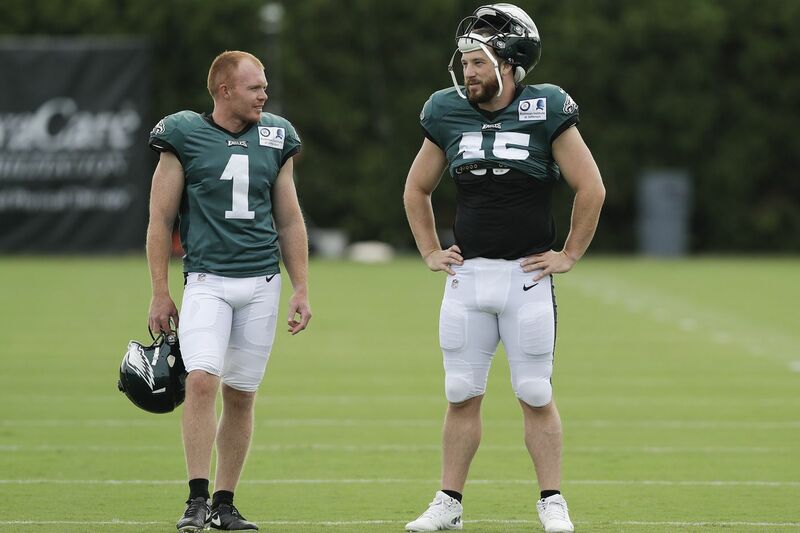 Eagles punter Cameron Johnston (left) and long snapper/holder Rick Lovato talk during training camp at the NovaCare Complex in South Philadelphia on Sunday, July 29, 2018. On Friday, Doug Pederson was asked for his comfort level with punter Cameron Johnston. "Extremely high," the Eagles coach said without pause. Pederson's ardent praise raised some eyebrows. Johnston had seemingly been inconsistent during the first week of training camp. Even if that evaluation was erroneous, it was surprising to hear an endorsement that fervent for a punter who had yet to kick in this preseason, let alone in a regular-season NFL game. "You watch him, he'll have four or five really good kicks," Pederson continued. "There will be an occasional one that will go awry just a little bit. But that's all part of his plan too. Part of his progression with what we're asking him to do directionally — right, left, try to get him outside the numbers. It's all new." Special-teams coach Dave Fipp has spent a fair amount of camp drilling Johnston on directional punting, often with the directive to angle his kicks between the numbers and the sideline. But it's nothing new for the 26-year old, who played collegiately at Ohio State and spent most of the 2017 offseason with the Eagles. Last year, Johnston, a native Australian, punted alongside Donnie Jones and was released just before the season. Signed to a futures contract on Jan. 3 of this year – he spent last season training in Columbus — Johnston was the lone punter on the roster when Jones announced his retirement on Feb. 27. The Eagles opted not to add competition, although as Fipp explained in June, Johnston would face a greater challenge punting alone. He wouldn't have a tangible foe to compare himself against, knowing that he's competing against the dozens of other punters the Eagles could easily sign with just the drop of a dime. Such is the life of an NFL specialist. "At the end of the day, even if you have a guy here – let's say there's 15 teams with two punters – there's still a handful of guys who don't have jobs at the moment who could be in the league, as well," Johnston said Tuesday. "So you may have competition here, but I've seen previous teams where you have two dudes and they both get cut for someone else." Even if the Eagles were dissatisfied with Johnston, they likely wouldn't make a move until later in the preseason or after NFL teams trim rosters to 53 players on Sept. 1. Johnston, first off, needs an opportunity to kick in live situations – one he'll get Thursday in the Eagles' preseason opener against the Steelers. He had solid numbers last preseason, averaging 44.9 yards on 15 punts with a net of 43 yards. His longest kick went 61 yards. He dropped three punts inside the 20 with only one touchback. But the sample isn't nearly large enough to assume he'll pick up where he left off. The 5-foot-11, 194-pound Johnston clearly has enough leg when given the green light to kick away. But situational punting makes up more than half of the job and Johnston conceded that he needs to be more consistent. "The plus-50 stuff I feel comfortable with," Johnston said. "I've been successful with that in the past in college. Just transitioning out here, putting the ball into play for the gunners. That's the main thing – letting the gunners play because they're super fast." Eagles undrafted rookie punter Cameron Johnston at training camp August 1, 2017. The main objective of directional punts that are angled toward the sidelines is to corner returners. But the hang time must be sufficient for gunners to get down the field and cover. The punts can sometimes come off at a low angle and thus aren't as aesthetically pleasing as high-arching boomers. Johnston has had far too many either shank out of bounds or clank short in camp, though, for the punts to be part of his plan. He has fared better on pooch punting. In college, he landed 109 punts inside the 20 during his career, breaking the school record by 31. The Eagles hadn't worked on punting out of the end zone until Tuesday, but Johnston had some of his best kicks backed up. The discipline in which he may have improved the most is holding on field goals and extra points. Fipp said in June that Jones had a decided advantage in that area a year ago. But Johnston hasn't appeared to make any holding errors in camp, at least when Jake Elliott has been called upon. The kicker has yet to miss a field goal attempt. The Eagles are far from the only team without punter competition in camp – 19 others have elected to carry only one on their 90-man rosters. Of the 19, three teams have a lone punter without NFL experience. The Jaguars (Logan Cooke), Raiders (Johnny Townsend), and Packers (J.K. Scott) are betting on rookies. But there are 12 teams with two punters and a few veterans and/or young punters with promise, and that could compel the Eagles to either add another body before the end of the preseason — if one were to shake loose – or after cut-down day. "We'll look at every player who's out there," Fipp told reporters in June. "Obviously, we'll watch [Johnston] and we're going to end up going with the best guy. Sometimes, that'll be the guy we have on the roster. Sometimes, it's not." And sometimes it's a player who used to be on the roster. In April, the 38-year-old Jones was granted his release form the Eagles' reserve/retired list. He wanted to play again. He's yet to catch on with another team, but he's training and ready to roll if the right offer comes along. "I try not to worry about it at all," Johnston said of possible competition. "It's out of your control. Anything can happen and it's just one of those things where you just control what you can control."